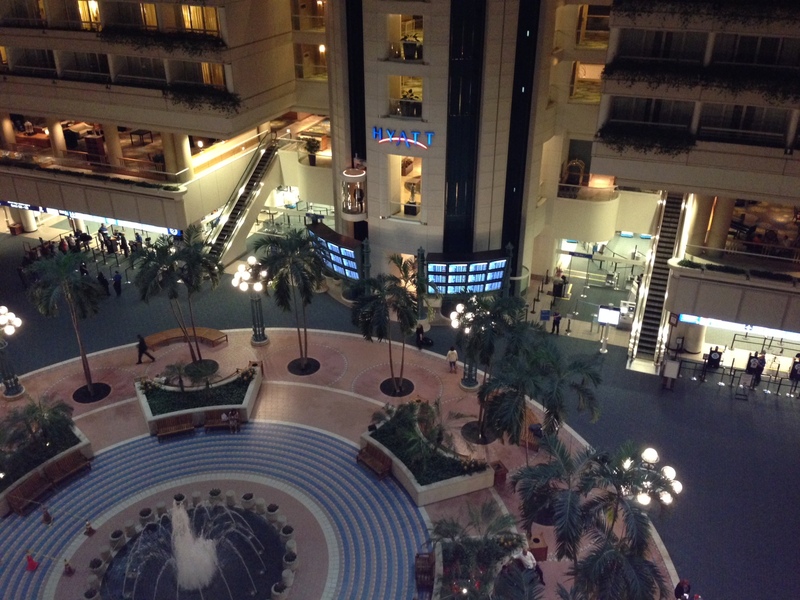 I’m looking down from my hotel room in the Hyatt Regency, Orlando, Florida, watching people check in for their flights. I’ve never stayed in a hotel that’s actually inside of an airport, and I can’t help thinking about that Tom Hanks movie (The Terminal) where, because of immigration issues, he becomes stuck in the airport for months. When the poor guy runs out of money, he starts eating serving-sized ketchup and mustard between Saltines and bathes and shaves in the airport restrooms. Unlike the character in the movie, my meals have been outstanding–and you know an allergic foodie rarely dishes out praise for hotel food. Lucky for me, our hotel room is on the same floor as Hemisphere Steak and Seafood Restaurant. Lucky because when we walked to our room yesterday, I caught a glimpse of the menu with many “GF”s next to entrees. Always a good sign! A few hours later, after my husband went off to a dinner meeting, I dined alone at Hemisphere. Of course, I am never really alone when I have Instagram, Twitter, and texting. Here’s the photo of my meal and view I posted to Instagram. 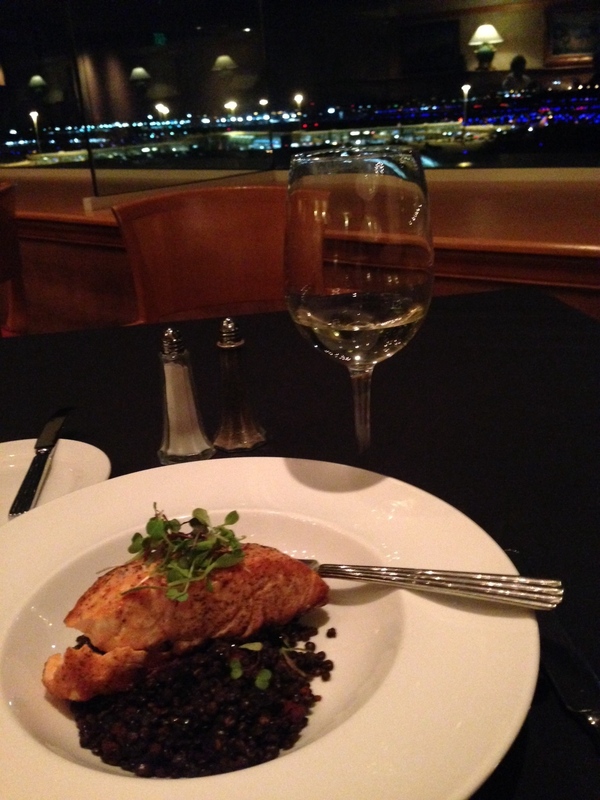 A moist Scottish salmon on lentils with a touch of cilantro. Delish. And the microgreens with beets and balsamic dressing that I inhaled before I could take a photo was wonderful, too. Before I ordered, the pleasant chef came out to discuss my allergies–kudos!! !–and though the kitchen staff got a little confused about the salad’s goat cheese (I can eat goat cheese but not cow cheese), I appreciated them leaving all cheese off because they wanted me to be safe. Besides, I took the goat cheese back to my room for an after-drinking apple and cheese snack. When I travel, I ALWAYS, ALWAYS take along a package of Main Street gluten-free instant oatmeal for breakfast. 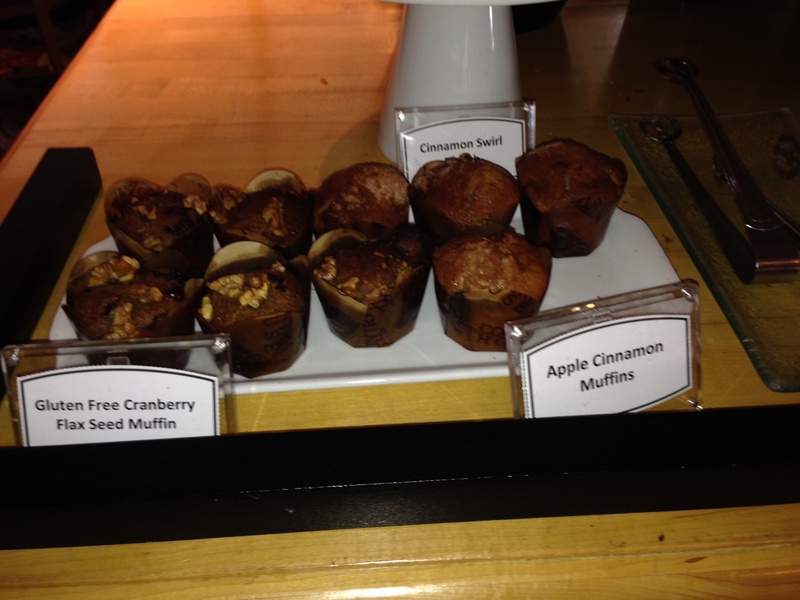 No need this time–this Hyatt actually has gluten-free muffins! Honestly, these are the best GF muffins I’ve tasted. What’s wrong with this picture? Yes, the GF muffins are served next to the gluten-laced muffins. However, the server went back to the kitchen to get me non-contaminated ones–along with a few extras for a midday snack. As I waddled out of the restaurant, I asked the hostess if all Hyatt Hotels were so allergy-friendly. I didn’t mention that I ‘d stayed at a few in the past that weren’t. Marriott: I hope you are reading this!!! I have NEVER EVER ate breakfast at a Marriott, unless you count a brown banana and a handful of walnuts breakfast. The pleasant hostess also mentioned the kitchen has rice and soy milk available for those of us with dairy allergies. Now it would have been nice to know this when I said I had a dairy allergy. I also had to ask a lot of questions about the buffet line food. Are the potatoes cooked in butter? What’s in the sausage? Is the bacon cooked on the same grill as the pancakes? If Hyatt truly wants to “carefully serve,” I suggest management comes up with an Allergy Menu including at least the top 8 allergens. While the staff today was top notch, a little more training could make them exceptional. Still, if I had to be stuck in an airport for months, this is definitely the airport (and hotel) I’d want to be stuck in. Not Your Average Airport Food originally appeared at Adventures of An Allergic Foodie.